July was something between the 7th and 8th month of working on the Spring Boot Buch and by far the most crazy one. I started the first draft of an outline by late November and early December 2016, shortly before reaching out to publishers. After deciding for dpunkt.verlag I did some milestone planing and as of today, I reached them all in time which was quite assuring. 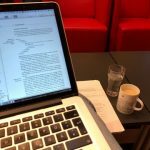 Last week I gave the complete manuscript in for review. I know that there are some real experts having a look at that stuff right now and I’m totally excited and anxious how that will turn out. The review should be completed by the end of August, than there’ll be another round of creative writing, than proofreading, typesetting and if everything works out, the thing will be out in December or January (though I really hope for December, in time with Spring Boot 2.0). What will be in the package? It’s basically the outline I published in in January, but the part regarding microservices heavily reduced. 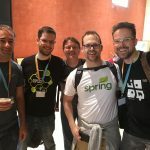 There’s so much inside Spring and Spring Boot that isn’t about microservices but just about modern software development, that one cannot do justice to both in the same book. Good for the readers I myself have the awesome opportunity to review another book about microservices that will cover exactly that. My book and the examples are all written agains the latest Spring Boot 2.0 milestones and I’ll make them sure that everything works with 2.0 final. 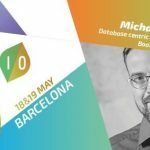 I’ll cover “classic” Web MVC as well as Springs reactive story. You’ll learn a lot about database access as well. 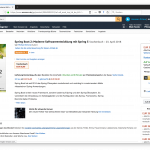 To keep you updated on the progress I set up a website: Spring Boot – Moderne Softwareentwicklung im Spring Ökosystem. It goes hand in hand with the official twitter handle @springbootbuch. So… I’m happy to start a new endeavor at @innoQ in October… exiting times ahead. Making the change at all and choosing between two great offers hasn’t been a decision made easily. ENERKO INFORMATIK is a good company and I wouldn’t be where I am right now without them, but it was the right decision to make. And trying to be a “consultant” is driven by the interest to get to know more projects, people and especially learn about a variety of topics I really don’t have a clue about. I’m quite sure that innoQ is a fabulous place to learn, discuss and grow. And regarding to naysayers in terms “you won’t be at home anymore” and stuff like that: Do you really think I haven’t thought and discussed through that? I’m already looking forward to a recap next just before next summers break. In late 2016 I was chatting with @GeertjanW about #JCrete and what I have to do to get there: I’m neither a Java Champion nor has my book already been published. For whatever reason however @HeinzKabutz invited me to the special 2017 edition of JCrete with a bigger number of attendees. 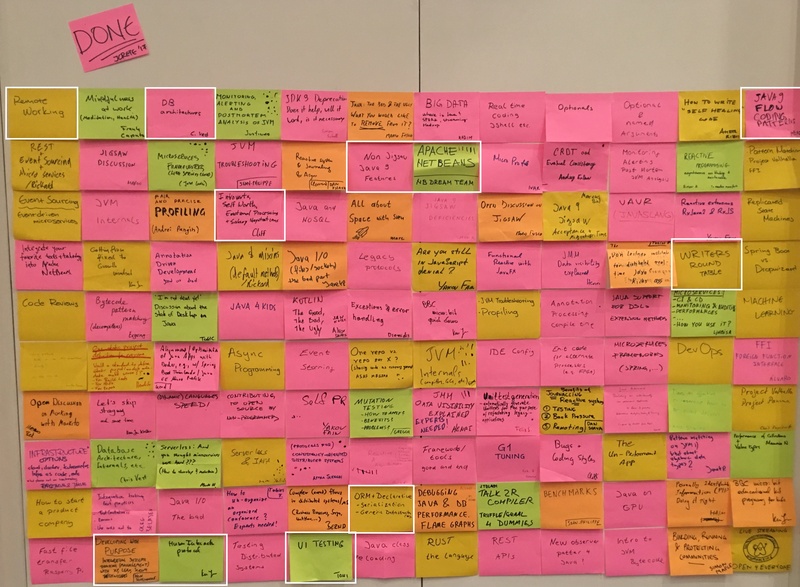 I loved every single minute being part of an amazing unconference and even better, part of that community, but honestly: It wasn’t vacation at all. From early morning to late in the night surrounded by people that have something to say and with whom one can have a great discussion is rewarding but also exhausting. Discussions where really high level. I have summarized them all at my foto-project site JCrete 2017, which will be available for two more weeks. More content is at JCretes official GitHub repository. Thanks to Rabea for curating all the content. I stumbled about a post by Dan Lew: An Introduction to Functional Reactive Programming. If you’re unsure what’s all the fuss so many people are talking about, check it out! Last week I was in Kassel, not only to meet with my longtime friend Jan, but also to speak yet again about database centric application, this time at the Jug Hessen. It’s great to see such in interest in SQL again. I really think implementing stuff in a way I suggest in my talk is of value in many situations. Not only when someone suddenly shows up and asks for a report, but for example as separate read and write models, too. To come to an end: August will be more quiet, I have to recharge a lot. Plans for the next 2 months are now: Reviewing a book, taking a that summer holiday and than one more month of cleaning up stuff, doing documentation and so on… I cannot believe that the first half of 2017 is already over. It have been 7 exhausting but tremendously rewarding months so far and I’m looking forward to the next. 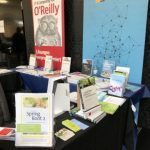 This entry (permalink) was posted on July 30, 2017 at 11:32 AM by Michael, tagged with innoQ, JCrete, jOOQ, Reactive Programming, Spring Boot Buch and categorized in English posts.